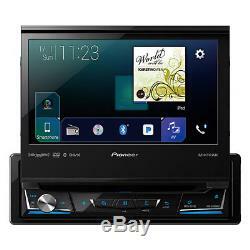 Pioneer 1-DIN Car Stereo DVD Player w/ 7 Motorized Fold-Out Touchscreen Display. Spotify, Works with Pandora, SiriusXM-Ready. Pioneer's NEX or networked entertainment experience line of receivers feature an innovative and powerful new user interface which is responsive and highly customizable. Apple Carplay The AVH-3300NEX features Apple CarPlay, the smarter, safer and more fun way to use your iPhone® in the car. Apple CarPlay gives iPhone users an incredibly intuitive way to make calls, use Maps, listen to music, and access messages with just a word or a touch. Android Auto The AVH-3300NEX also features Android Auto which extends the Android platform into the car in a way that's purpose-built for driving and automatically brings you useful information and organizes it into simple cards that appear just when they're needed. It's designed to minimize distraction so you can stay focused on the road ahead. The Connect Car With AppRadio Mode, Pioneer has taken the technology from our revolutionary, game-changing AppRadio and placed it in the AVH-3300NEX so you can experience control of compatible apps directly on your dash! The intuitive interface is formatted and designed specifically for safer in-vehicle operation. AppRadioLIVE AppRadioLIVE simplifies your drive by combining the information you need during your commute into a single, simple to use interface. Hands-Free Calling and Audio Streaming Stay safe and obey local hands-free laws with built-in Bluetooth (HFP). When a registered Bluetooth device is in close proximity to the receiver, the auto connection function automatically pairs the two units. Spotify App Control® With Spotify being a dedicated A/V source on the AVH-3300NEX, you now have the ability to control content from the Spotify app on iPhone and Android devices. You can play, pause and skip tracks, browse playlists, albums and radio stations on the go using the Pioneer controls. If you are a Spotify premium user (requires a monthly paid subscription), you can enjoy ad-free, high quality music even when there is no internet connection. Keep the party going with MIXTRAX®, an innovative Pioneer technology that creates a non-stop mix of your music library complete with a range of DJ-inspired effects. Drawing from Pioneer's rich DJ heritage and our passion for music, MIXTRAX delivers a unique DJ infused listening experience to those in the car. MIXTRAX takes the music from an iPhone, iPod, USB device, or certain Android devices and plays it back with added transitions and effects, creating a virtual DJ inside the Pioneer receiver. Song, artist, time and album information are beautifully displayed on the 7 touchscreen. Powerful searching tools such as Link Play and Alphabet Search to help you find content faster. What's in the Box? DVD receiver w/ motorized-retractable 6.94 touchscreen monitor. CR2025 3V lithium battery (installed in remote). Four M5 x 6mm pan-head ISO screws. Four M4 x 3mm pan-head screws. M5 x 3mm counter-sunk ISO screws. MOSFET 50 W x 4. 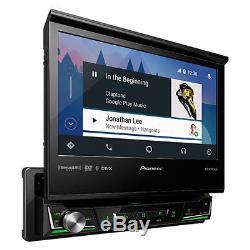 The item "Pioneer 1-DIN Car Stereo DVD Player with 7 Motorized Fold-Out Touchscreen Display" is in sale since Wednesday, July 26, 2017. This item is in the category "Consumer Electronics\Vehicle Electronics & GPS\Car Audio\Car Audio In-Dash Units". The seller is "electronic_express" and is located in Nashville, Tennessee.